The BlackBerry KEY2, already available in the U.S. and Canada since earlier this month, will be launched in India on July 31st. The country is the second largest smartphone market in the world, but without a strong economy, consumers there are buying value priced phones from Xiaomi and lower-range Samsung models. Priced at 42,990 Rupees ($623 USD) in the country, the sequel to the BlackBerry KEYone might prove to be a difficult sale in India. Especially when the Xiaomi Mi Mix 2s will be available next month for around 38,000 Rupees ($551 USD). The KEY2 will be offered in India exclusively from Amazon, and has several improvements over the original model. For example, the keys are 20% larger, and the physical keyboard includes a new Speed Key allowing users to access 52 possible user-set shortcuts from any screen. The handset also carries the first dual-camera setup to ever grace the back of a BlackBerry phone. While the chipset has been bumped to the Snapdragon 660 Mobile Platform, and the phone now includes 6GB of RAM and 64GB of native storage, one thing that TCL didn't change is the 3500mAh battery. The latter should keep you tap, tap, tapping on your KEY2 for up to 48 hours. If you live in India, you can head to Amazon's site to set up a reminder that will notify you when the phone is about to be released in the country. To get to that site, simply click on the sourcelink below. Blackberry is not going to sell that many units with the high price tag. I don't understand why they think they can sell the Key2 at a price point that matches flagship prices. Good thing BlackBerry doesn’t sell smartphones anymore, lol. I know that’s a hard pill for you to swallow, but thems the facts. I can provide links proving what I’m saying, can you provide links proving that BlackBerry still sells smartphones? The only thing that you are providing is technicalities and goalpost moving. You are deflecting from the truth of the point. Not technicalities or goalpost moving. You’re stating that BlackBerry sells smartphones. I have proof that they don’t. Now either you provide proof that they do, or you’re just in denial, as usual. When I say sell, I don't mean them actually selling the device but of course you obviously just don't want to admit that because you want to move the goalpost back again. LMAO! Yes, walk back that statement now and switch it up because you’ve been outed for posting false information again. Of course, you won’t just admit that you have been willfully posting false information concerning that all along because you’re making up a fake goalposts to begin with. Remember what happened the last time you pulled this stunt? You couldn't find anything wrong with my comment other than the fact that it was made by me. I agree. They have never been good at pricing their products. It’s going to be an uphill battle, to say the least, for BLACKBERRY MOBILE/TCL to move many units in India at that price. 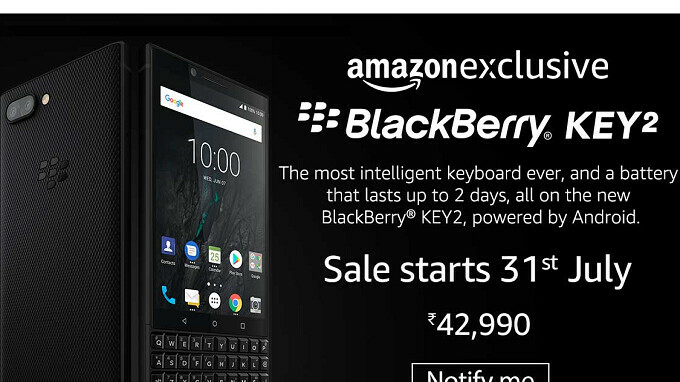 If the KEY² lite or whatever they call gets released, perhaps that would fare better in India, as the price will no doubt be less than the KEY². So you're saying that I was right in my initial comment? So you’re going to retract the part in your initial comment that says BlackBerry sells smartphones when they actually no longer do? Not my fault if you misunderstood my comment, but then again you did jump to conclusions once before and that ended badly for you. LMAO! What’s to misunderstand? You literally said that you don’t think BlackBerry is going to sell that many units...now you’re walking your statement back because you’ve been proven wrong. But of course, you’d never admit that you’ve been knowingly wrong all of this time, and you were just spreading false information, which always ends badly for you because you always get corrected. There's nothing to walk back on. You took my comment out of context and now you're backtracking after I pointed it out to you. You have no one to blame but yourself. LMAO! Your denial is astoundingly hilarious. You literally said that BlackBerry sells smartphones and they don’t. The only one here that doesn’t know context is you. Now do keep walking your statement back and playing damage control while I lmmfao. I never said they were part of TCL. I think old age is affecting your way of thinking. But you did say that BlackBerry isn’t going to sell a lot of units, effectively spreading false information. It’s BlackBerry Mobile, a part of TCL, that sells BlackBerry smartphones, not BlackBerry. Crispin was just trying to educate you, but as usual, you deflect from the fact that you’re willful posting of false information is what started this in the first place. Can’t expect not to be corrected on an open forum when you willfully and continuously post false information. Omg, does it really matter that much? The point was that they aren't going to sell that many units with the high price tag. You're arguing with technicalities. LMAO! Look at you all triggered because you once again claimed that BlackBerry still sells smartphones and I once again corrected you over it. You’re deflecting from the fact that you constantly say this, and now you’re seething with anger because you know deep down that you’re wrong. It’s not a technicality, it’s a fact. You’re arguing when you’re the one in the wrong. And that's why you're continually wrong. By admitting BlackBerry isn't part of TCL you're proving that in your feeble little mind BlackBerry has something to do with the manufacture, sales and distribution of BlackBerry-branded handsets. Give it up already, you've been owned.